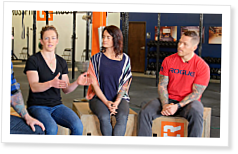 In Part 5, the conversation continues as CrossFit Inc.’s Tyson Oldroyd discusses hiring new coaches with Pat Burke of MBS CrossFit, CrossFit Verve founders Matt and Cherie Chan, Nicole Christensen of CrossFit Roots, and David Tittle of CrossFit Low Oxygen. In addition to discussing onboarding processes, the six debate whether it’s better to hire from the outside or develop someone in the gym community. Matt Chan recommends finding an athlete others in the gym gravitate toward and sending him or her to the CrossFit Level 1 Certificate Course. That’s the first step in developing a good trainer, he says. Tittle says the most important thing is “finding somebody that cares” and is passionate. Additional audio: “CrossFit Radio Episode 311” by Justin Judkins, published Jan. 4, 2014.